At Beam Camp, kids learn basic construction skills, and gain experience with problem solving and team building. Deep in the woods of Strafford, New Hampshire, kids are playing with power tools. They’re climbing on jagged structures, and learning to weld from adults dotted with fresh tattoos. 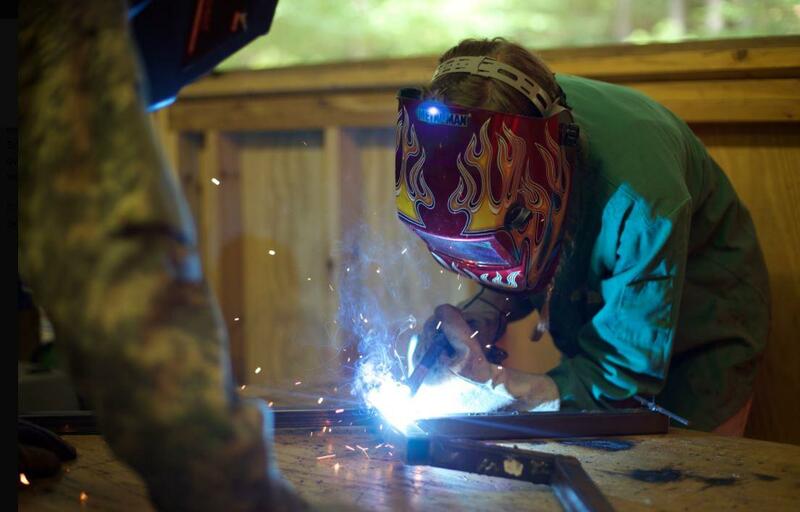 Don’t sweat it: it’s just another summer at Beam Camp, a makerspace for youth in the outdoors . You ever come across something in the woods that doesn’t quite make sense? Like a rusting-out old Buick or something? Well, walk around the 101 acres of Beam Camp in Strafford, and you may just find a 30-foot tall steel kaleidoscope. Or, in another clearing, huge wooden swings connected to chimes. A project from the recent past: giant wood swings, connected to chimes. Each summer, the kids who attend Beam Camp go big and they go weird. Campers, who range in age from 10-17, team up to build large scale interactive projects, which are designed by professional architects and engineers. They hammer, they weld, they make, and then they leave the project behind. While that may sound like a pretty great summer, Oliver didn’t arrive with high expectations. Danny Kahn shows off a giant metal flip book, one of last year's projects at Beam Camp. Super fun, but not just fun. He says carrying out an ambitious construction project, while also mixing in normal sleepaway camp activities such as swimming and games, create a new kind of learning experience. During this summer’s first of two three-week sessions, campers teamed up on a wild-looking project called the ‘Kinetic Cluster,’ designed by Fruzsina Karig and Kate McAleer. “We’re making, like, a 3D dome,” explains Daniel, a camper from New York City. The Kinetic Cluster consists of a raised platform with a retractable dome roof. On its perimeter, 15 seats that, when occupied, trigger a gear system that rolls back the dome, revealing the sky. Waves of campers rotate building different parts of the Cluster. Part of the learning process at Beam Camp is figuring out how to pull off this kind of massive, intricate project as a unit. Well said, kid. But other campers find the process inspiring. Many of the campers are from New York City, where Beam also operates as a year round non-profit, called the Beam Center. While the sticker price for each session is $5,700, most kids receive some level of financial assistance. When summer is over, Danny Kahn says some campers will go home and continue making. Others, though, won’t pick up a tool or sketch an idea out a big idea until next year. And that’s okay. The completed Kinetic Cluster, pictured at night. New Englanders, broadly speaking, are a thrifty bunch. Between garage sales, dump malls and Market Basket, we understand the value of a dollar. That makes the launch of a new Repair Café in Peterborough a natural fit. To the uninitiated, it's the French horn — though that's a bit of a misnomer. To its players and students, it's simply a horn, an instrument that has featured in orchestras for centuries. The horn's sound is easily recognizable thanks to the prominent role it's played in some of the most epic classical songs and movie themes. But it's still an uncommon instrument, and not the easiest one to build community around. 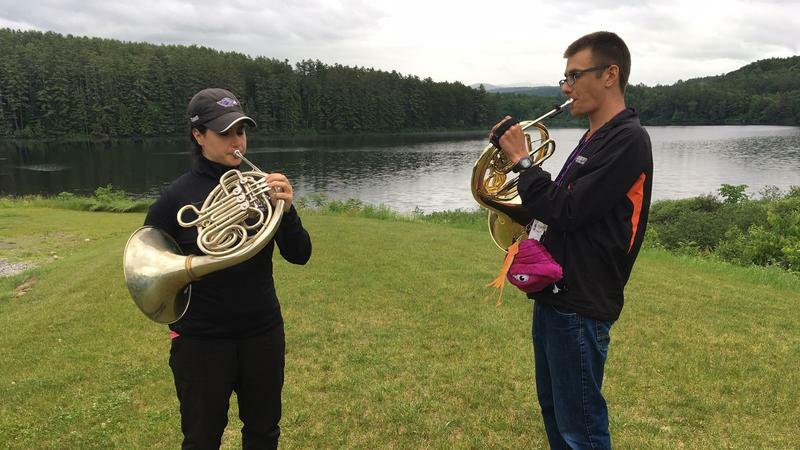 To that end, dozens of horn players head into the woods in the White Mountains every summer to celebrate and learn more about their instrument. The idea of taking a child to prison for a week may bring to mind visions of "Scared Straight" programs. 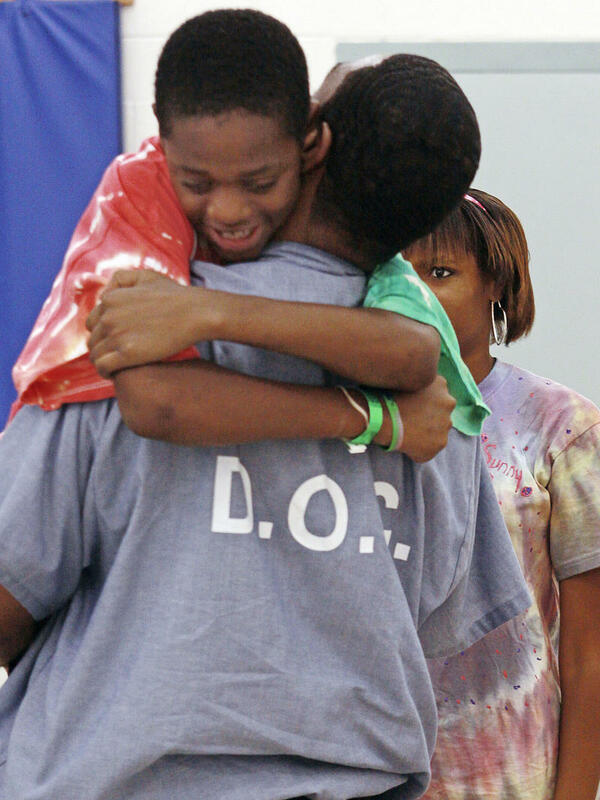 But the Father to Child Summer Camp Behind Bars does just that — and the goal is to let kids bond with their fathers, who might be incarcerated far from their families. The unique summer camp lodges children at a campground near prisons in Maryland and North Carolina, according to Here & Now, the show from WBUR and NPR. The kids visit their fathers in prison each day.